Following on from Germany’s World Cup win, we thought it was an opportune time to write about the unusual German Class of 1890. 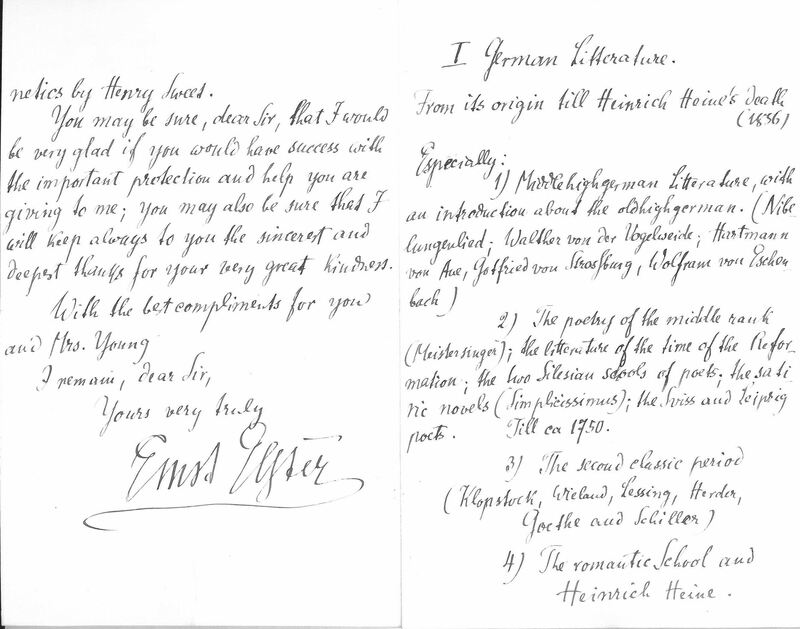 Not until 1887 was a part-time lectureship in Modern Languages first established at the University, and it was Dr Ernst Elster who received the appointment as lecturer of German Language and Literature (GUA21932, 27 Nov 1886 Letter from Dr Emile Elster to Professor Young applying to be allowed to give lectures in German language and literature). Elster went on to appointments as Professor of German Literature in the universities of Leipzig and Marburg, and was followed in post by Dr Hermann Georg Fiedler, in 1889, (later Professor of German at Oxford University); and in 1890 by Dr Alexander Tille. As the information they provided on their matriculation slips is sparse, it could suggest that all were residents of and working in Glasgow at the time, like Johann Nicolaus Kiep, who was serving as Imperial Consul at Glasgow at the time of his matriculation and had extended family connections in the Glasgow area. Interest in the teaching of Modern Languages as a legitimate subject-area of study in British universities wasn’t developed late in the nineteenth-century and with an amount of opposition, as student Editor Carol Hunter noted in her blog post on the first appointee to the Lectureship of French Language and Literature at the University of Glasgow in 1895, Alfred Mercier. So this German class of 1890 shows to a great extent that the introduction of teaching of Modern Languages at University was actively supported by diverse members of the local community who were eager to foster international understanding and relationships through education.